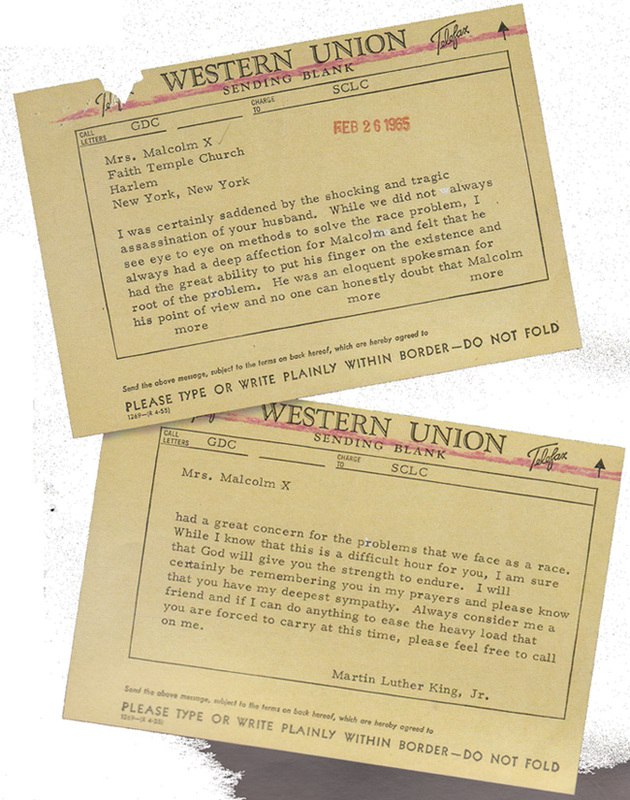 Telegram from Dr. Martin Luther King, Jr. to Betty al-Shabazz expressing his sympathy for the death of her husband, Malcolm X.
I was certainly saddened by the shocking and tragic assassination of your husband. While we did not always see eye to eye on methods to solve the race problem, I always had a deep affection for Malcolm and felt that he had the great ability to put his finger on the existence and root of the problem. He was an eloquent spokesman for his point of view and no one can honestly doubt that Malcolm had a great concern for the problems that we face as a race. While I know that this is a difficult hour for you, I am ure that God will give you the strength to endure. I will certainly be remembering you in my prayers and please know that you have my deepest sympathy. Always consider me a friend and if I can do anything to ease the heavy load that you are forced to carry at this time, please feel free to call on me.